We are at the beginning of the third millennium for the Azerbaijani capital Baku, a period that will be remembered for a constructional boom of an unprecedented scale. Of course, throughout its history, the city has been renewed, rebuilt, enlarged. New housing estates, neighbourhoods, parks, cultural and social facilities have appeared. But the developments happening now are both qualitatively and quantitatively different. We are witnesses to a fundamental rebirth of the city, its transition in to another ‘architectural dimension.’ This is a real cultural and town–planning revolution. However, the city has witnessed dramatic change once before. In the late 19th and early 20th centuries, an oil boom in the then little–known, provincial city of the Russian empire turned Baku into a cultural and industrial centre of the South Caucasus over a few years. Baku was born as it is known to millions today – the Windy City and the city of ‘black gold.’ The oil barons, as if competing with each other to show their culture and generosity, erected uniquely beautiful buildings and cultural structures that withstood comparison to the most beautiful architectural sites in Europe of that period. Baku gained a reputation for being an open, cosmopolitan city, at the crossroads of all sorts of religious and cultural traditions, nations and languages. Then, under the Soviet regime, there was a long period of relative ‘calm’ when Baku changed gradually, almost invisibly, to the casual onlooker. Today we are in the midst of the second petroleum boom. The signing of the ‘contract of the century’ by the 12 largest global oil companies in 1994 marked the beginning of Baku’s passage into a dynamic and self–renewing metropolis. Today, vast areas of the urban environment are bustling construction sites. The town–planning policy has a clear and uncompromising drive toward the future that is now inexorably close to us, right in front of our eyes in fact, when we behold the most extravagant architectural structures of the city – the newly built Heydar Aliyev centre, designed by the architect Zaha Hadid, and the ‘Flame Towers’ to name just two. But like any progressive process, this transition is not without failures, mistakes or risks. In particular, a radical re–formatting of the urban landscape requires the utmost caution towards the old buildings and architectural structures of enduring historical value. Baku is a city with a history dating back to ancient times and its story is reflected in stone, in the architectural appearance of the capital. The dynamics of the unprecedented pace of change and the heat of a large–scale renovation mean the disappearance of rare and unique parts of Baku might be going unnoticed. For this sake, the officials involved in urban policy should be assisted by independent expert communities, cultural figures and artists aware of the unique quality of the old and historically priceless artefacts. One such artist is Aida Mahmudova, who has focused her creative activity on the cultural and aesthetic relevance and re–contextualisation of objects belonging to the architectural past of Baku. She is far from indifferent to the old and worn spots, battered by time and ruthless circumstances. Mahmudova belongs to a generation not only open–minded to all new things, provoking liberal innovative changes in society, but also to one less linked to the past. As the past disappears rapidly into the shadow of the world archive, the younger generation, who are now around 30 years old, have not had time to become spiritually attached to these cultural formations, they seem too ‘ancient’ (in historical scholarship this has been called ‘time compression’). By contrast, Mahmudova embodies a reverent attitude to nostalgia, centred on such urban places, which are fixed in her childhood memory. The installation by Aida Mahmudova is an example of this reverence. 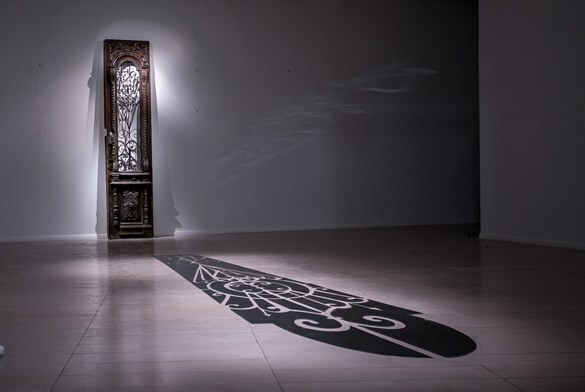 In the installation there is only one old door, shabby yet noble in its beauty and craftsmanship, and in front of it is a cast shape on the floor, made from polished stainless steel and resembling a fallen shadow ​from the metallic ​lattice of the door. These two visual elements – volumetric and planar figures – mark the vertical and horizontal of the composite space. The object is minimalistic, but is has a history, or rather prehistory. The door was once part of a residential house in Sovetskaya street, which according to new town–planning is soon to be demolished. Many of the houses on this street have already been demolished and the others are waiting their turn, reminding us that everything has its beginning, continuation and end. Or in even shorter terms – everything is born and dies. But if we think of this in another way, everything does not die, but transforms, and is reborn in a new way. It might be that the initiator of the new birth is an artist who puts an object doomed to disappearance, into the guise of an artwork – and this is at the core of Mahmudova’s work. This composition is one of the many works inspired by a long–term fascination with such transience and renewal. The strategy is simple and noble: to give new life to old objects, so as not to interrupt the relation between the past and the present. The installation by Mahmudova tracks two concerns which originated in modern art – the ‘ready made’ and Arte Povera (Italian for poor art). These traditions are brought together with one important caveat – in Mahmudova’s work she has included a quality that is risky for contemporary art – the quality of beauty. This presents a risk because the aestheticisation of an object can reduce it to the level of applied design, neutralising critical issues that are crucial to the discourse of modern art. The shift from the brutality of Arte Povera to a more aesthetically focused composition is brought about by the ornate ‘shadow’ cast on the floor. And here we come to the most delicate aspect of the author's creative strategy; the first impression is that there is a shadow on the floor, but if we look closer, we will see subtle inversions. The stainless steel does not ‘fill in’ where shadows from thin iron rods of the lattice should be, but on the contrary, the steel falls where the openings between the rods are. Such contradiction is resolved in the work with the utmost sensitivity to these openings and shaped spaces between the rods. The reason for this focus on negative space is to highlight her recurring concern with time and memory. What is a lattice? A door or window lattice, it does not matter ... First of all, it is a material object of planar shape, consisting of a pattern of iron rods, with openings between the rods, which together make a clear pattern faceted by the rods. We must admit that our attention is mostly attracted by the mesh pattern of the rods, our view also penetrates the openings, not dwelling on them; we immediately see the things on the other side of the lattice. This is similar to how we look at the world through the closed glass window – we can see what's going on outside the window, ignoring the glass, to which we can pay attention only if it has smudges, scratches, and so on. But these figurative openings of the lattice are no less important than the mesh pattern of the rods; both have an important visual load. In addition, the lattice is the border between two worlds, between the interior of the home and the outside world. Being indoors, we look through the lattice on the outside, we see what is happening there, in the outside world. The door swings both ways, the observer on the other side of the rods in the outside world can see what is inside the house. Now imagine how many views during the existence of this door penetrated from here to there and from there to here ... And it's not just many views of certain people living in a particular historical time. In a symbolic sense we are talking about the special optics of vision, which may be described as the universal ‘Eye of Memory’ accommodating a plurality of views of people of different generations. The ‘Eye of Memory’ is invisibly and paradoxically accumulated in these cross–cutting patterns, on the border between the worlds. To exhibit it, it is necessary to give material form to this invisible ‘substance’. Hence, Mahmudova fills in the openings with solid material and it changes something invisible and etheric into something visible and tangible. She concretizes and compacts the things that can disappear subtly. The artist, therefore, perpetuates the fleeting and subtly perceptible, crystallizes the spiritual, commemorates a moment... Another association related to the symbolic stainless steel polished to a high finish used by Mahmudova, is the theory by Nikolai Aleksandrovich Kozyrev, who is said to have invented the legendary ‘Kozyrev's mirrors,’ in order to compress time. On top of that, the author seems to aesthetically balance the outline of iron rods and patterns of the openings between them, unwittingly recognising the equivalence of the figure and background. So we can see that the door and the complex horizontal figure on the floor complement each other. The door, being ready–made, gives momentum to the subject, while the lattice suggests a more delicate ‘needlework’. In addition to this symbolism, the work of Mahmudova is unobtrusively beautiful, yet totally devoid of saccharine prettiness. Aestheticisation of the object in this case was an important matter – she transferred the object from a naturalistic dimension to a symbolic one – the door is no longer just another door, but became like a ‘monument’ to the door itself. A hundred more such doors from the same street became a thing of the past during the demolition of Sovetsky. Yet this door is not just fortunate to stay intact and be re–purposed as a work of art, but it has now become a symbol, projecting the ‘idea’ of all the similar old objects, fatally doomed to physical disappearance.